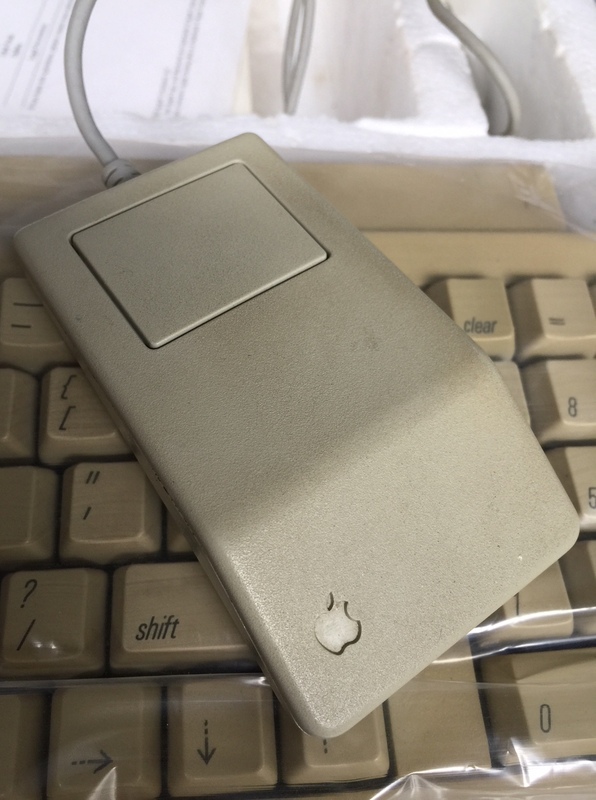 It’s been years since owning a beige Macintosh, and I had an itch to own one again. 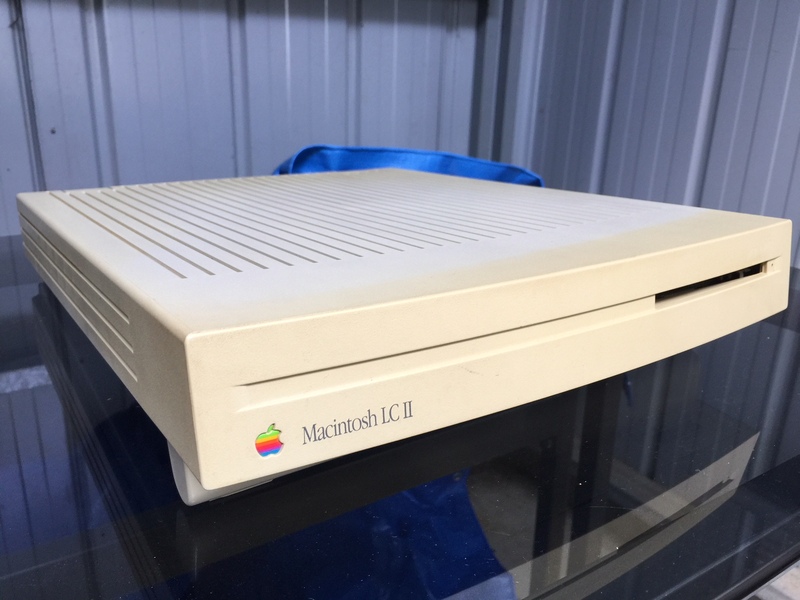 A little while ago I picked up this Macintosh LC II off eBay, from the state of Queensland. 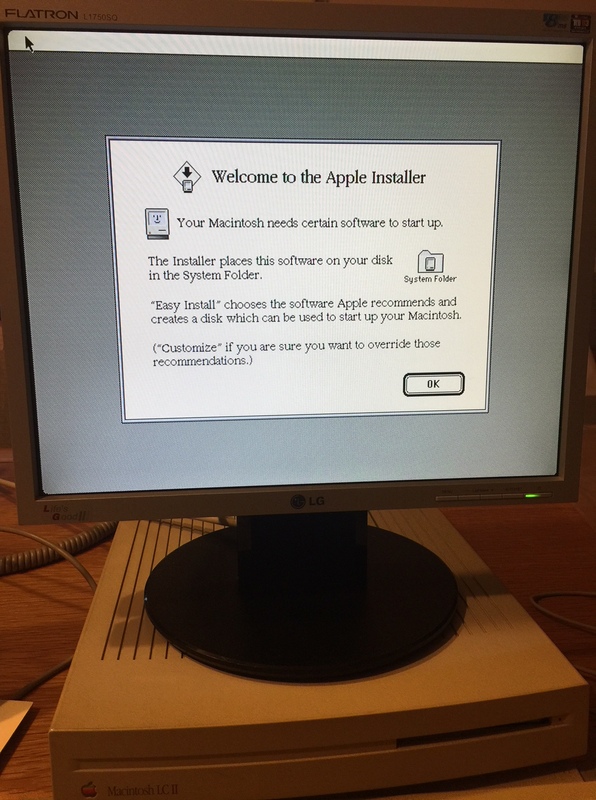 Getting a Mac from the LC series wasn’t my first choice, having preferred finding a Quadra or Performa instead. Between price, condition, and the models out there to choose from it’s hard pickings. Nevertheless there was some sentimental value towards this model – it was the model I experienced using a Macintosh for the very first time. 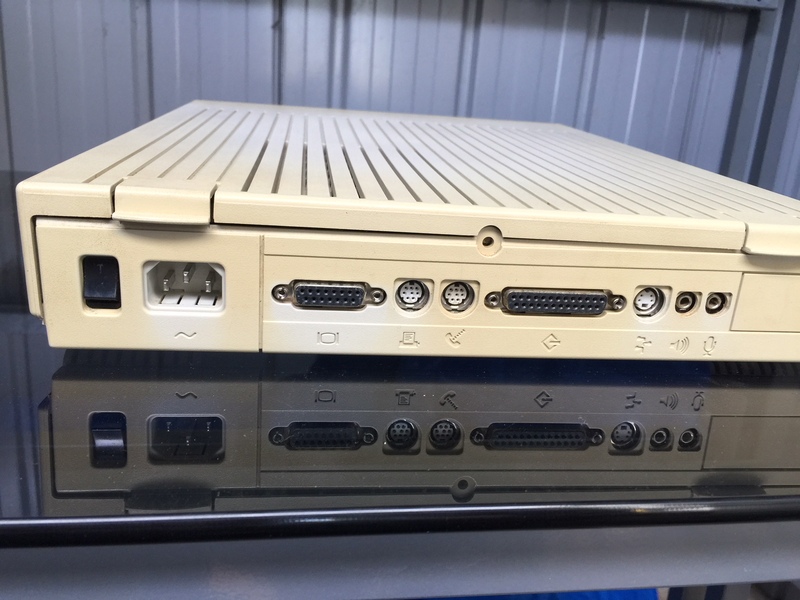 The LC family began with the original Macintosh LC released in October 1990, and the series continued up until 1997 with the Power Macintosh 5200/75 LC in an all-in-one form factor. 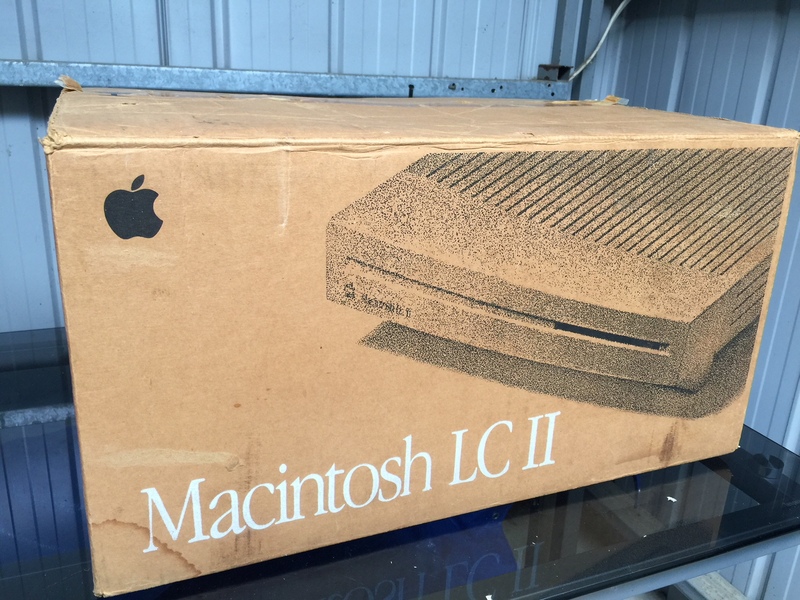 The earlier LC models were commonly referred to as pizza boxes, given their slim design, and in hindsight could be seen as the then Mac Mini. I’m not fully certain on officially what the LC represented, whether it was “low cost”, “low cost colour”, or from the name of Project Elsie in which the objective was to build a more affordable Macintosh with a colour screen. Whichever it may be, the LC was aimed for families and the education market as a lower cost alternative to the Macintosh II. 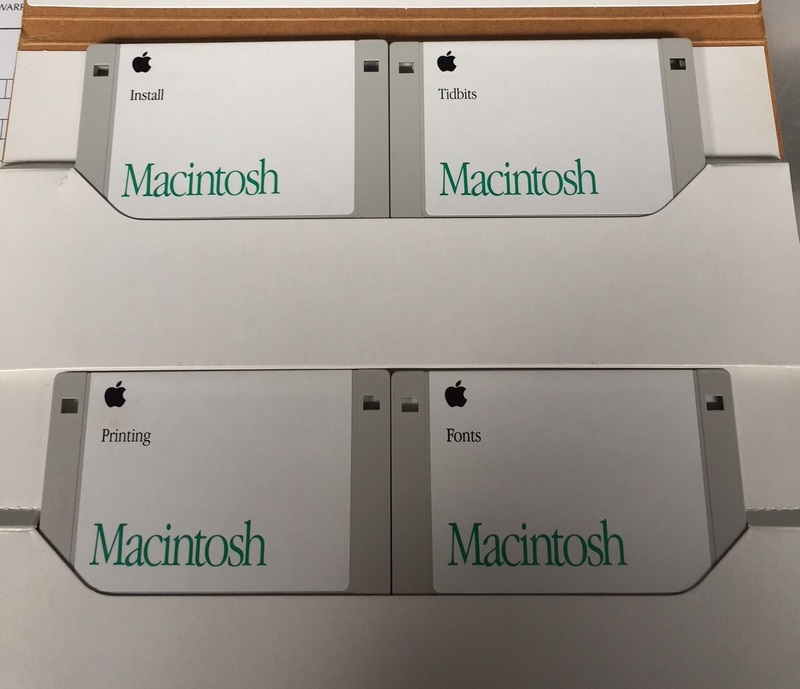 Starting with the original Macintosh LC, these housed a Motorola 68020 16 MHz processor, 2 MB of onboard RAM, 256 KB of video memory, and a 40 or 80 MB SCSI hard disk. In order to reduce costs, the LC was crippled. 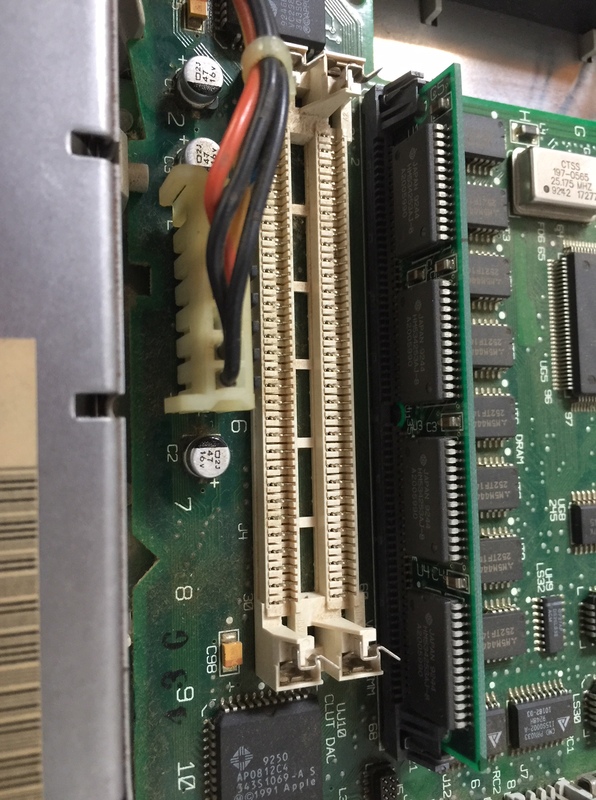 The processor despite being 32-bit was restricted to a 16-bit data bus, there was no floating point coprocessor, and RAM was restricted to a maximum of 10 MB in total. These specifications didn’t set the world on fire, but eventuated to being a success for the intended market. 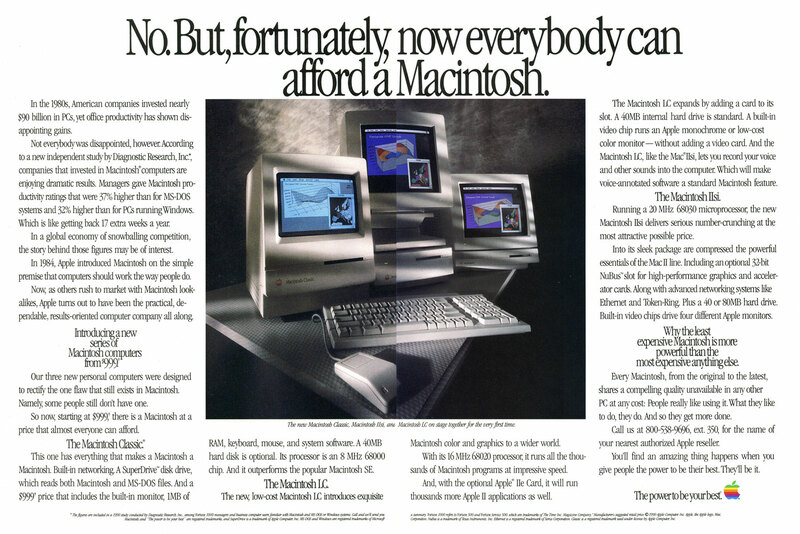 The Macintosh LC II was a revised update in early 1992 although performance wise wasn’t any better really, still hindered by the 16-bit data bus. 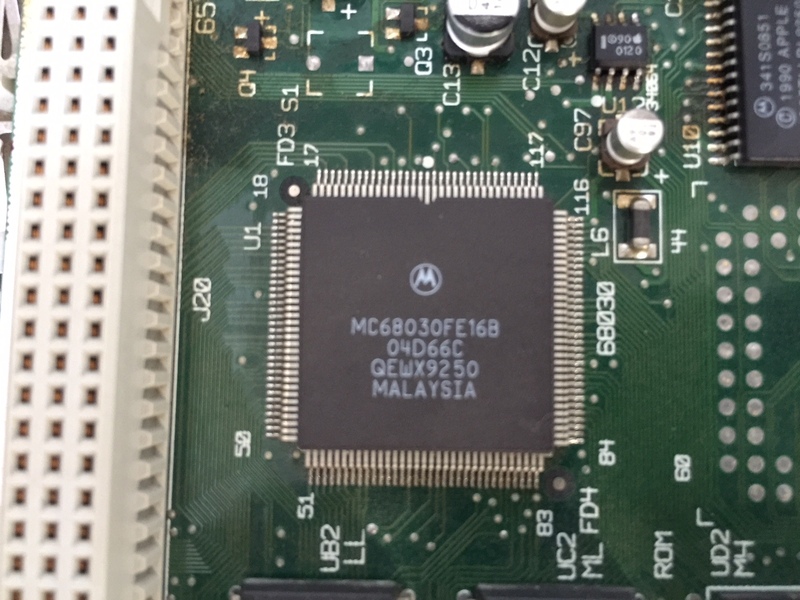 The processor was upgraded to a Motorola 68030 though stayed at 16 MHz, and the onboard RAM had been upgraded to 4 MB. The 68030 processor introduced support for virtual memory. These changes were made in order to sufficiently run System 7.0 that had been released after the original LC. 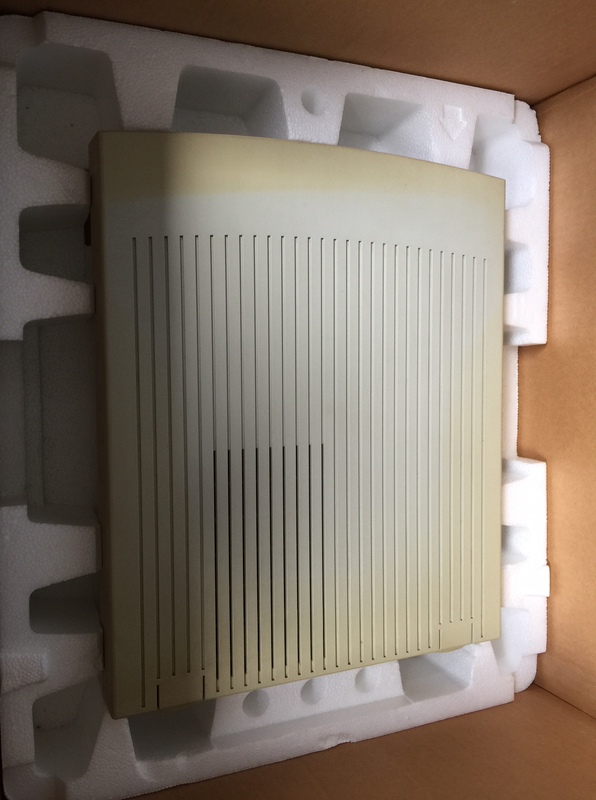 Although the LC II could be seen with a 40 MB SCSI hard disk and 256 KB of video memory, it was possible upon purchase to upgrade to an 80 MB drive and 512 KB video memory configuration. The LC II I received surprisingly had most of the original packaging intact. 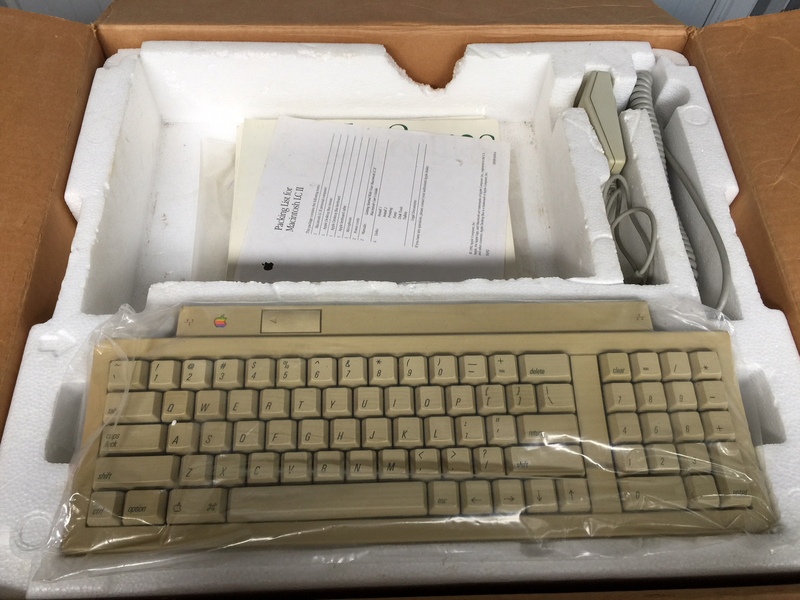 No monitor was included – originally this and the previous model regularly came with Apple’s M1299 12″ RGB monitor. The original keyboard suffered the worst from yellowing. Pulling out the Mac, apart from the light yellowing around the sides was in good shape. The two plastic clips to secure the lid on the back were intact, as these had a history of snapping off due to carelessness and weakening of the plastic. Deciding it was best to open it up and check the components and blow out any excess dust, I went to inspect it. Overall it was reasonably clean, needing nothing more than a spray of compressed air. 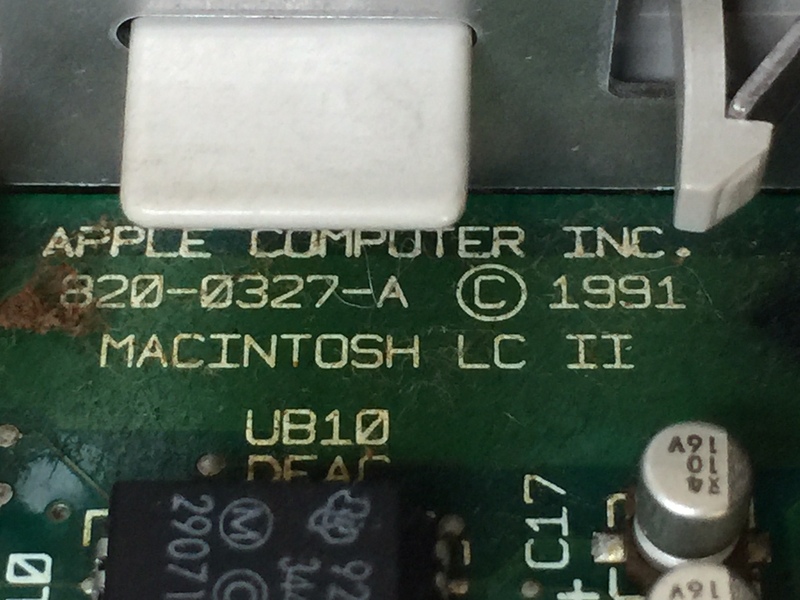 Inside the Macintosh LC II. Somewhat unfortunate, it was noted only the 4 MB of onboard RAM was available, requiring some 30 pin SIMM modules to boost it up to 10 MB. Inserted into the VRAM slot was 256 KB of video memory. 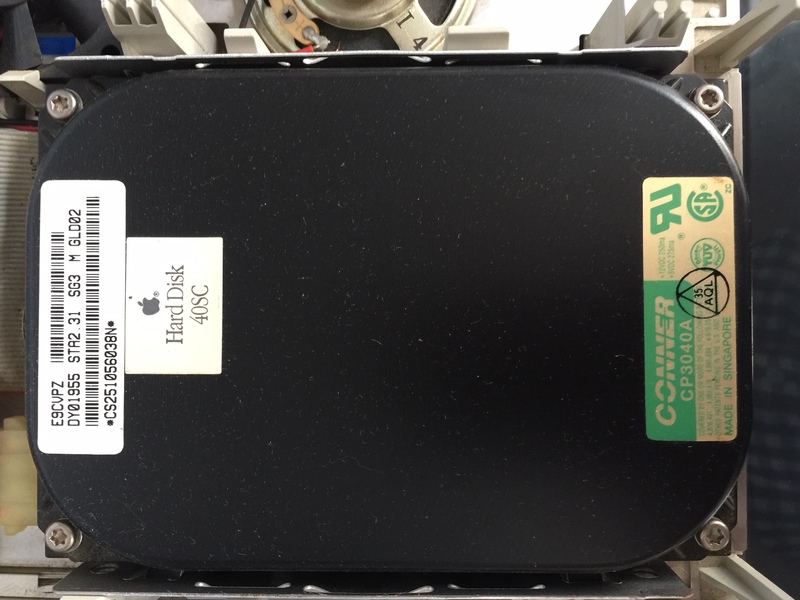 The original 40 MB hard disk was also still there, a CP3040A manufactured by Conner. Closer view of the motherboard, no battery is installed. The 40 MB Connor SCSI hard disk drive. The RAM and VRAM slots. Not having a suitable Apple monitor, eventually I bought a video adapter in order to use the myriad of old LCD monitors that used VGA cabling. 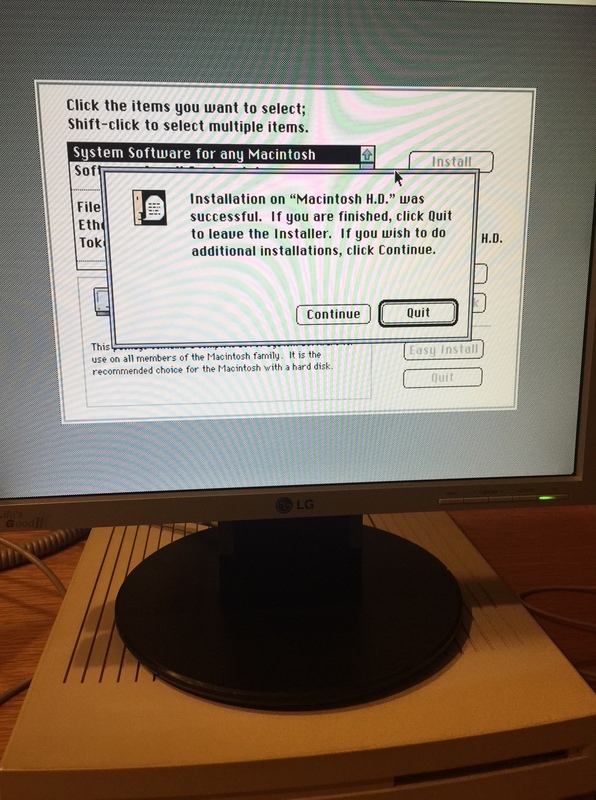 With the adapter in hand, I went to set up the Mac on the dining table for the first time, with the adapter’s DIP switches to output to 640 x 480 resolution. Success! 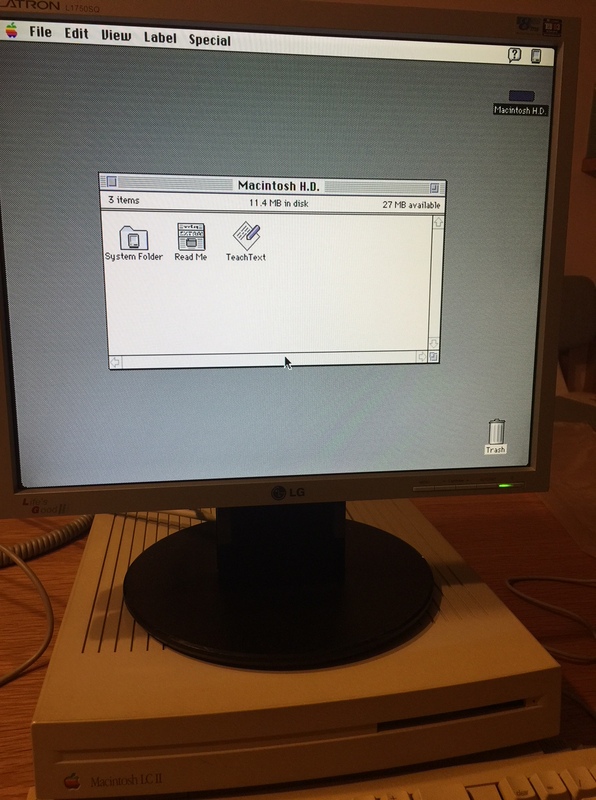 The Mac chimed and after a couple of moments came to the System 7.1 desktop. Without a PRAM battery installed, the system date winded back to the year 1956 and the video output was set to monochrome. A quick visit to the Control Panel sorted those out. Checking over the hard disk there wasn’t a great deal on there – a couple of games (Tetrix – a Tetris clone, and Connect4), DiskDoubler 3.0a, and ClarisWorks 4.0. Running ClarisWorks 4.0 was chewing up system resources rather quickly. In the LC II’s heyday I frequently used ClarisWorks 2.0 which felt more appropriate for this machine. 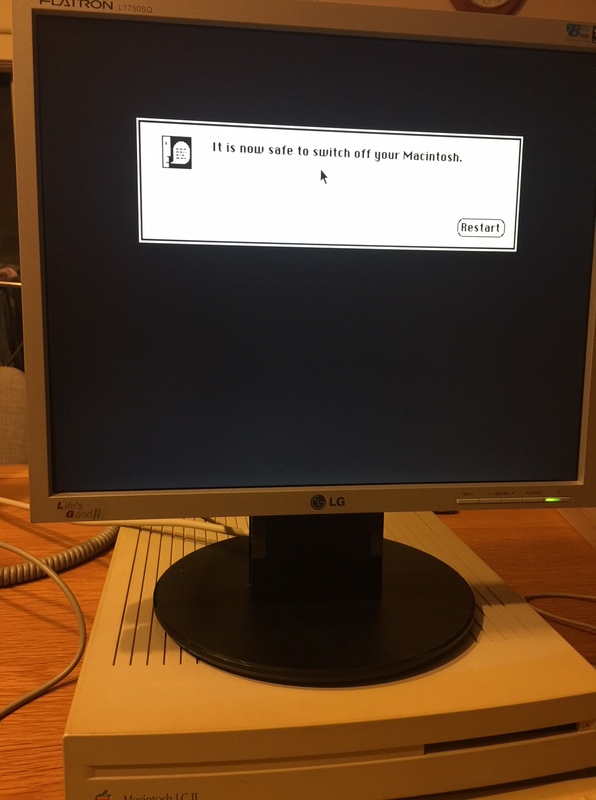 Seeing that there wasn’t anything worth saving, I went to use the original included floppy disk set to install a fresh copy of System 7.1. It was also an opportunity to see whether the floppy disks and drives were to be a cause of grief. Proceeding with the floppy disk named Disk Tools I went to reformat the hard disk before installation. 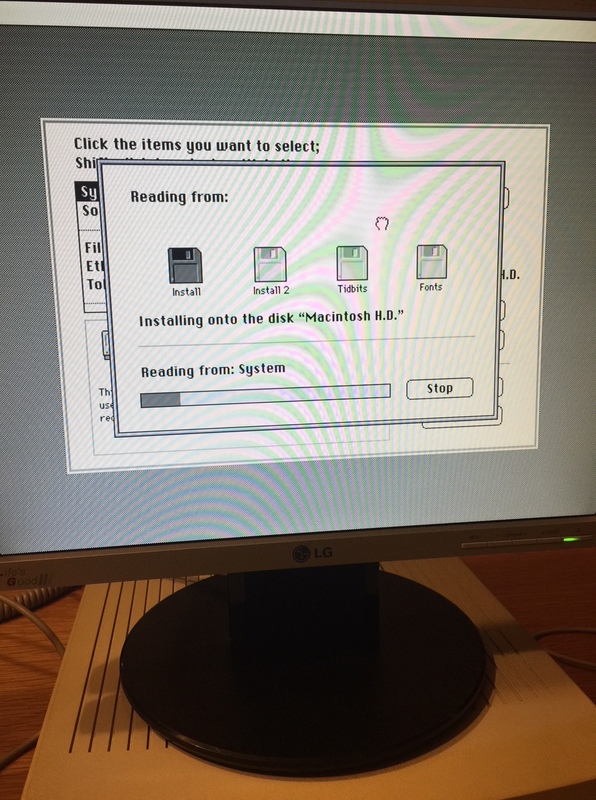 Then upon rebooting it was time to shuffle between the installation disks. The Mac after the hard disk was wiped clean. 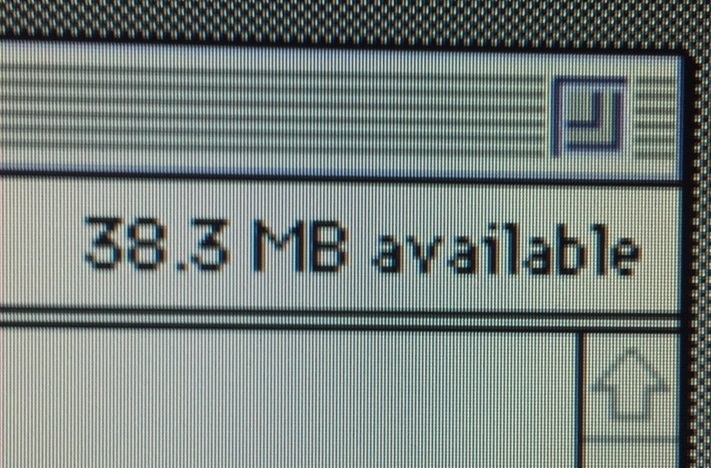 Use that disk space wisely! Installation was a simple affair, only requiring four floppy disks. I was half expecting a disk read error of some form, when thankfully there wasn’t. With System 7.1 installed, approximately 27 MB remains offering little to spare for virtual memory and applications. 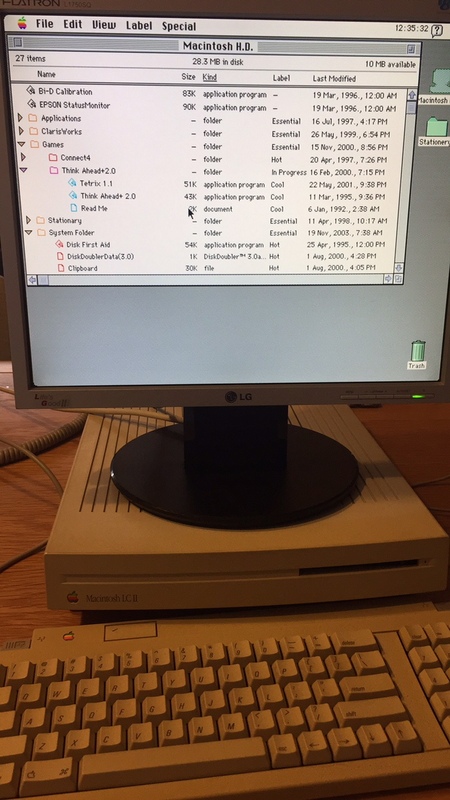 The LC II can be upgraded to System 7.6.1, but would chew up half the hard disk space and use more RAM, so there’s little incentive to proceed with that. Installing from the first of four disks. 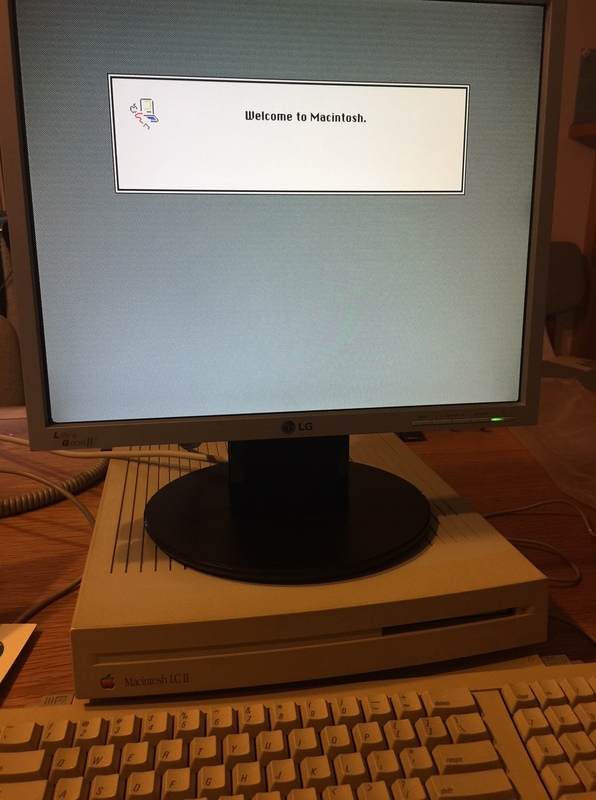 Afterwards System 7.1 is installed, 27 MB doesn’t leave much for anything else. Next steps for this Mac would be to source some extra RAM – ideally to at least 8 MB for a modest performance gain to reduce reliance on using the old hard disk for virtual memory. My main concerns though are the hard disk and power supply – now around give or take 25 years old. The hard disk can be replaced with a SCSI to SD card adapter, though at prices around $130 AUD it isn’t on my high priority list at the moment. With the power supply, I’ll need to find someone whose electronically minded and good with a soldering iron, as I’m not confident opening up a power supply for servicing. Owning this LC II makes me wish I retained the LC III that I purchased back in the late 1990s from an auction. In the same form factor though with a slight aesthetic refresh, the LC III was comparatively better released in 1993. 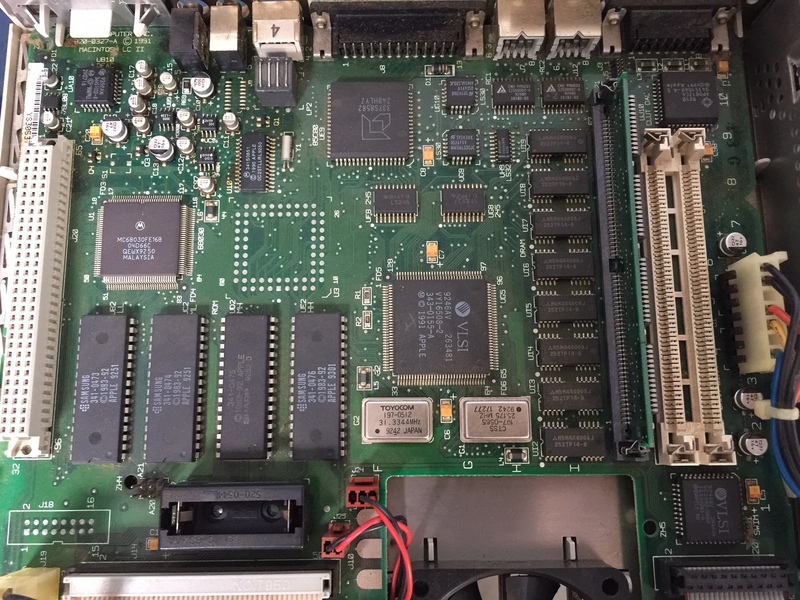 The motherboard was given a makeover and housed a Motorola 68030 processor running at 25 MHz with a 32-bit data bus, 512 KB video memory (expandable to 768 KB), hard disks up to 160 MB, and supported up to 36 MB of RAM using newer 72-pin SIMMs. These specs make running System 7.5 a lot more comfortable, with multitasking, and generally a more useful machine. With all their shortcomings, the early LC models bring back fond memories using these back in primary school. They sparked my interest in the Macintosh and I kind of wanted one, but not enough to switch entirely from a DOS-based PC. 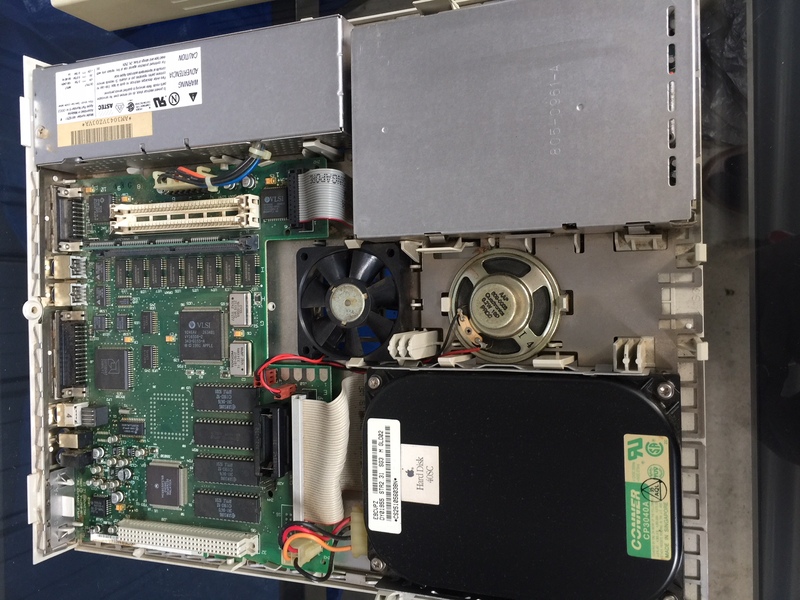 By 1997 the school upgraded these to the Power Macintosh 5500/225. Shortly after this occurring, the school arranged me to have a day off from normal classes and work with the computing teacher. 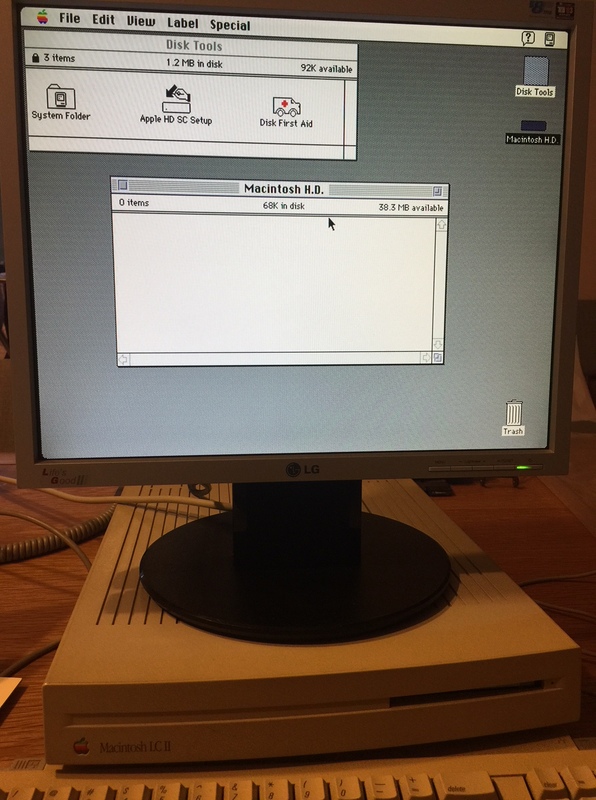 The day was spent sorting out the piles of LCs, reformatting the hard disks, installing system software and applications, and setting up an AppleTalk network. The end result was another computer classroom, specifically catering for the younger students. 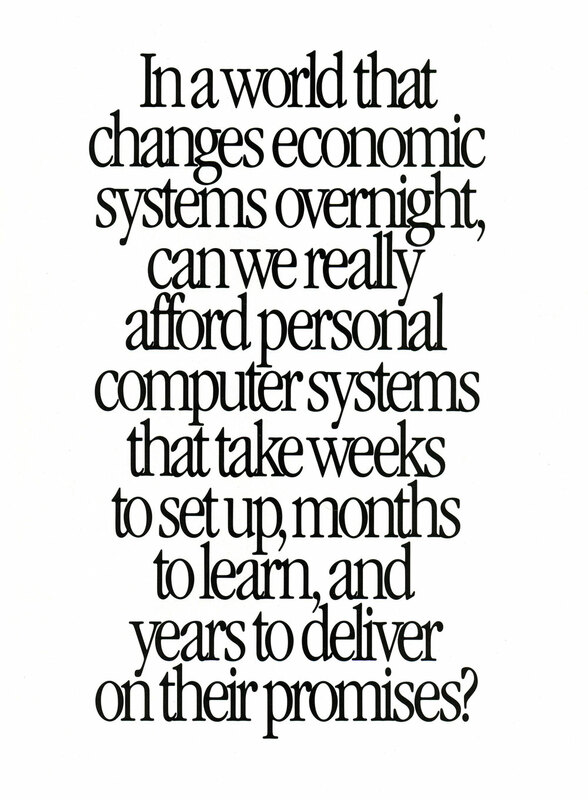 InfoWorld’s May 1992 issue had a review on the Macintosh LC II. In July 2017, technical specifications of these and other 68k and PowerPC Macs were made available on the Apple Support website. Love this, I recently bought more of these types of machine than Ill happily admit to my better half (2x LCII and 1x LCIII). One thing – ensure you change the capacitors on that board, I can see they’re leaking their corrosive insides over that fantastic machine. Its a simple enough job, takes about 40 minutes if you have the correct tools. I’ll be the first to admit my experience with doing such tasks lacks competency. Any tips would be appreciated. I wouldn’t suggest doing this if you aren’t comfortable/familiar with the process 9or have tried on lesser machines!). There is huge scope to do a lot of damage (like pulling up a pad/wrecking a track). Additionally, you need some decent tools to do this correctly – such as hot tweezers/hot air rework stations in addition to an Iron. There are likely some services in Aus that can do this for you, I aware it has a very active 68K Mac scene. That said, this is something you should really address sooner than later. If you cant recap, then at lease use electrical cleaner spray and cotton buds on the PCB/caps (you may need to do this regularly). This was one of the machines my family had when I was growing up. Seeing some of those pictures was a trip down memory lane for me. I just recently found my parents’ old LC II in storage and am thinking of firing it up. Need to make sure all the necessary peripherals are present though.